Separated by a highway, Kampung Baru is isolated from the progress and modern niceties of the city. The Government’s decision to redevelop Kampung Baru, a Malay reserve enclave in the heart of Kuala Lumpur, has met with mixed reaction from the landowners and residents who have lived there for many generations. Based on a valuation done on a 55ha site in March 2007, the land was valued at between RM270 and RM300 per sq ft for housing and RM500 and RM600 per sq ft for commercial lots. 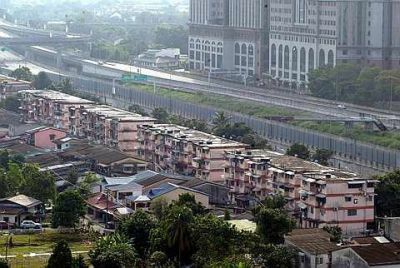 As the land is now worth billions of ringgit, it has caused a lot of concern among the Kampung Baru folks about their future. “We want to know about our future and what the benefits will be for the landowners if this proposed redevelopment by the Government materialises,” says Kampung Baru Development Association president Dr Mohd Yusof Ismail. Meeting him recently at the Kampung Baru mosque during the normal busy afternoon during Ramadhan where traders are busy selling food for breaking-fast, the Cornell University PhD scholar talks passionately about the current situation and the feelings of Kampung Baru folks to StarBizWeek. “I was appointed as president of the association about a month ago and my main task now is to be the voice on behalf of the landowners of Kampong Baru. We support the Government’s decision to redevelop Kampung Baru but we want to know what type of mechanisms the Government will implement,” he says. Mohd Yusof says meetings among associations, landowners, residents and the Government have been held a few times since the draft of the Kuala Lumpur City Plan 2020 was unveiled in 2008. “The draft is the starting point of the seriousness by the Government to focus on the redevelopment of Kampung Baru. What the landowners of Kampung Baru want to know is how much they will get from the value of their land and what is going to happen to their land rights,” he says. At one of the meetings, a proposal to have 60:40 land ratio for Malays and non-Malays was brought up and Mohd Yusof says he was the first person to object. “However, we agree that properties can be leased or rented out to non-Malays, but there should not be any transfer of titles or ownership. Kampung Baru represents a symbolic presence of the Malays in the capital city. Therefore, it belongs to all Malays in the country and that interest should be safeguarded at all cost,’’ he says. He says that matter has already been solved when the Government retracted the proposal. There were three components to the redevelopment plan; one of it is that the Cabinet has agreed that Kampung Baru will be developed comprehensively. Secondly, that a Kampung Baru development corp will be formed and a bill tabled in parliament to allow for the setting up of the corporation by the end of the year and finally, only a government-linked company will be involved in the project. It is understood that Permodalan Nasional Bhd has been selected to be the lead developer for Kampung Baru and reports say international real estate valuer Rahim & Co will be appointed to revalue the land. “If Rahim & Co is appointed for the valuation, they will do it on behalf of the Government. What will happen to us then is we also need to do the valuation from our side so that it will be fair. We may appoint an international valuer. Mohd Yusof also reveals information he has gathered for the fair basis price of each sq ft in Kampung Baru compared to surrounding areas such Kuala Lumpur City Centre, Jalan Yap Kwan Seng and Jalan Tun Razak. He believes the price of the land shall be about RM1,000 per sq ft and above. “To say the price of the land to be only RM350 per sq ft is something unacceptable, whereas the land around Kampung Baru is worth more than that,” he says. He, however, admits the re-development of Kampung Baru is going to be a long process. On the measures the Government may undertake, based on the current law, he says the better option to the landowners is either to sell entirely or a portion of the land to the Kampung Baru development corp.
“This, however, needs to come with an attractive price for the landowners to agree,” Mohd Yusof says. The proposed setting up of Kampung Baru Development Corp by the Government is to protect the interest of the owners and their heirs. It will also responsible to ensure the owners and heirs receive the fairest deal possible no matter the type of development. Despite the support from Mohd Yusof and Kampung Baru Development Association on the proposed redevelopment of Kampung Baru by the Government, there is still some reluctance among landowners to agree with the redevelopment. A landowner let off some steam when asked on his opinion on the proposed redevelopment of Kampung Baru. “Do you think RM1mil or RM2mil is really worth it. What will happen to our next generation? You think you can bring the money with you when you die?” he says.